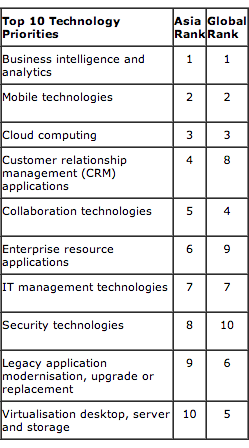 Every year Gartner produces one of the definitive surveys of IT priorities based on input from CIOs around the world. It is usually one of the most influential and most quoted surveys and this year’s survey will be no exception. According to the latest published survey (September 2012), CIOs rated Business Intelligence, Mobility and Cloud Computing as their top 3 priorities over the next few years. Commenting on the results of the survey in his insightful and well-informed Forbes tech blog (9/16/12), Louis Columbus made a few key observations that Treasure Data very strongly agree with. The first of these observations is that customers are changing and that astute CIOs “are quickly prioritizing analytics, cloud and mobile strategies to stay in step with their rapidly changing customer bases.” This is a trend that we see very clearly – many of the inquiries that we get from companies are how can they use Treasure Data to get deeper insights into customer behavior so that they can tailor products and services that meet the needs and expectations of these customers whether they are consumers or business customers. As a result of these pressures, Columbus argues that “long technology evaluation cycles, introspective analysis of systems, and long deployment timeframes are giving way to rapid deployments” and this trend is very clear to us at Treasure Data. Whether these rapid deployments are done by line of business units circumventing IT or by IT themselves, the need to innovate quickly is becoming a key driver of IT priorities. In Treasure Data’s opinion, the cloud is the only way that IT will be able to innovate at the pace that their internal and external customers expect. As these customers apply consumer “need it now” thinking to their business needs, IT simply doesn’t have time to analyze, design, provision and deploy using traditional models. It’s great that CIOs “get it” but what the industry needs is for these execs to ensure that their front-line IT teams have the training, resources and capability to implement their vision of the data-driven mobile enterprise.